Located in Belavadi village, Veera Narayan Temple is considered as one of the finest examples of unique Indian architectural design. 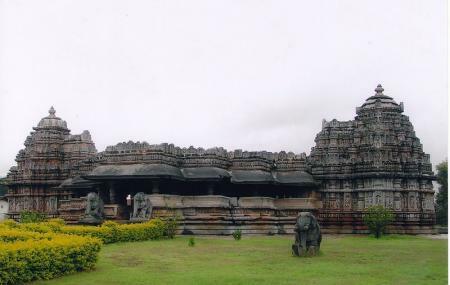 Built in the 13th century, the architectural structure of this temple has followed Trikuta style. It is huge and spacious. Step inside the temple to see the slanting slopes of the entrance. The flares of steps that leads inside the temple has two elephant statues installed on its either sides. The outer walls of the temple are covered with beautifully carved running pilastersand decorative towers on the top. Hence, visit this temple to admire the stunning architectural work of ancient India. Ask the authorities if you wish to pay donation. Ask the locals about the pooja timings. How popular is Veera Narayana Temple? People normally club together Halebeedu and Coffee Museum while planning their visit to Veera Narayana Temple.